If you are looking for an environmentally friendly and minimalist laptop stand to help keep your hardware a little cooler and positioned in a more ergonomic tilt while typing. 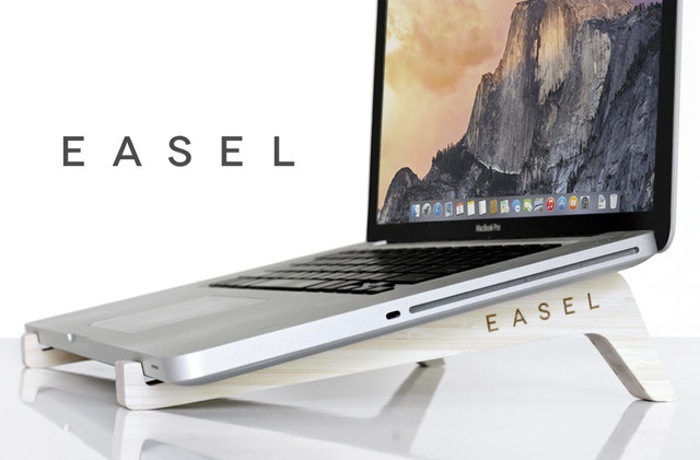 You might be interested in a new laptop stand created by Jordan Mummert called the EASEL, which has just launched over on the Kickstarter crowd funding website looking to raise enough funds to make the jump into production. “I researched my symptoms online and discovered that my laptop was slowly damaging the health of my body. From work, to browsing the web, to my late night brainstorming sessions – I was using my laptop frequently and I was feeling the repercussions. While searching for a solution, I stumbled across ergonomic laptop stands. Much to my dismay, all I could find was unattractive, boring, and basic models. So, I was determined to design the best laptop stand. After many weeks of conceptual work and prototyping, EASEL was born. So if you think EASEL is something you and your laptop could benefit from, visit the Kickstarter website now to make a pledge and help EASEL laptop stand become a reality.